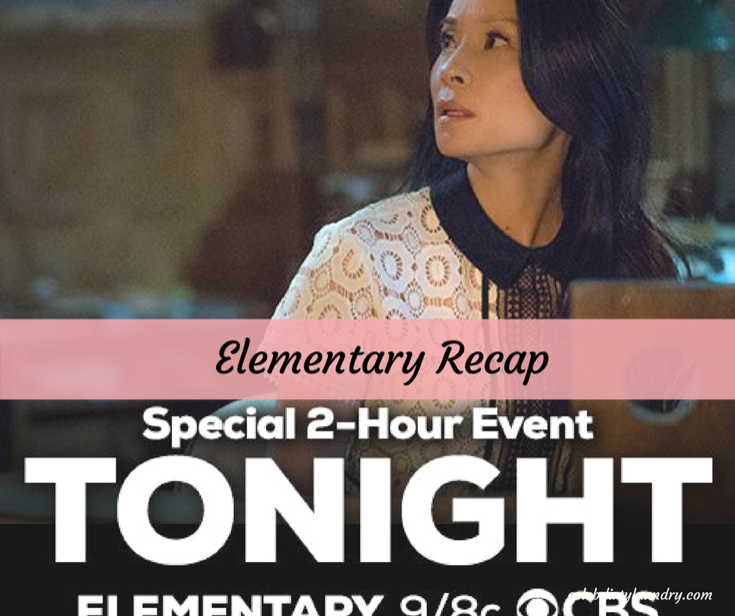 So make sure to bookmark this spot and come back between 10 PM – 11 PM ET for our Elementary recap. While you wait for our recap make sure to check out all our Elementary recap, spoilers, news & more, right here. Holmes attends the funeral of his old colleague Cy Durning. While at the cemetery he gets a text that says the death was a murder and to meet in five minutes. Holmes goes and finds his former protégé, Kitty waiting for him. Watson comes home to find Kitty and Holmes. Holmes tells Watson that Kitty thinks they are both in danger. Kitty tells the story of Kotite, a man that Kitty and Holmes helped put in prison several years ago. Kotite was released from prison three weeks ago and three people involved in the case have died in unusual circumstances. Holmes wants Kitty and Watson to go speak to the captain about the case but Watson is worried. When Kitty left three years ago she was involved in a serious incident were a man was hurt and the captain suspected Kitty caused the injuries. Kitty said she wrote the captain a letter right after she left and she thinks everything is now OK between them. The captain is happy to see Kitty and they embrace. At first he thinks her story is farfetched but becomes convinced and tells Kitty he will help in any way he can. Kitty gets a text and leaves before she can see Marcus. Holmes confronts Kotite. He denies any wrong doing and chalks the deaths up to karma. Watson thinks there is evidence that Cy may have been poisoned but they will need to exhume the body to prove it. The captain won’t give them permission to do it. Watson thinks Kitty has been acting strangle since her return but Holmes is not concerned. Watson gets a call from the captain that someone dug up Cy’s body and set it on fire. If there was evidence of foul play it is now gone. Holmes finds hair in the backhoe used to dig up the grave that he thinks belongs to the man involved in the murders. He is a white male with graying hair dyed red. Watson and Kitty speak to ME but learning nothing new. They both think she is lying. Holmes and Marcus question Cy’s widow and she can’t believe someone killed Cy. She remembers seeing a man with red hair standing on the sidewalk as she left the day Cy died. Watson goes to Kitty’s home and waits until she leaves. Watson enters and is immediately attacked. Kitty returns and stops the nanny from fighting Watson. Kitty has a baby. She introduces Watson to Archie and says his father is an old boyfriend from college. Kitty plans to leave the force once they catch Kotite. She is a mother now but worries that Holmes will be disappointed. Kitty and Marcus call in the ME for questioning and ask if she had every met the redheaded man but she denies it. They let her know they have a witness who will swear the man was in her lab right before she completed Cy’s autopsy. They believe she was paid to cover up his murder. She refuses to cooperate. Holmes is able to find proof that the ME received $50,000 dollars from a swiss bank account the day she signed Cy’s death certificate. Kitty has her nanny bring Archie to meet Holmes and as they are talking Kotite call Holmes. He suggests they meet again soon. Holmes tells him they will be at his house first thing in the morning with the police and shares that they know about the bribe. Kotite reports he had nothing to do with the murders but is pretty sure he knows who is. He asks Holmes to meet him at the club and Holmes leaves. The next scene shows Kotite land on the roof of the car that was waiting to take him to meet Holmes. He is obviously dead. Holmes and Marcus meet in the morgue. Marcus believes that Kotite killed himself but Holmes does not. Kitty and Watson are at the scene of the crime and also believe that Kotite was thrown from the roof. They all realize that Kotite was not behind the murders. As they return home they find the FBI searching the residence. Watson and Kitty leave before they are seen and Holmes in arrested by the red headed man who says he works for the Defense Intelligence Agency.